The country’s two most notable counter-pressing teams met at Wembley again, as Tottenham failed to get their revamped stadium ready for the match. These games have typically been closely-fought, with the exception of this same fixture last season. 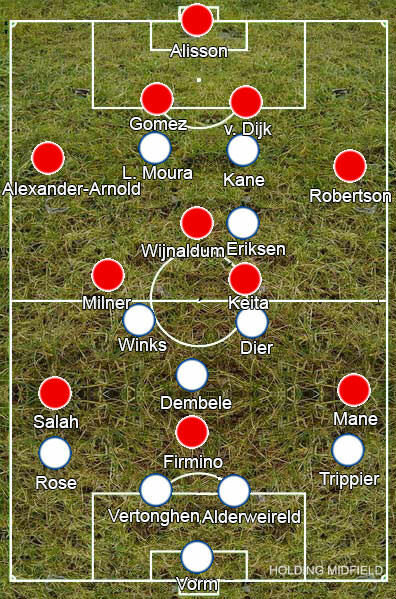 Jurgen Klopp continued with his 4-3-3 formation, going back to the line-up that started the season, with Naby Keita returning to the line-up in place of Jordan Henderson, while Mauricio Pochettino opted for a 4-3-1-2 shape, with Danny Rose, Eric Dier and Harry Winks coming into the team at the expense of Ben Davies, Davinson Sanchez and Dele Alli after their loss against Watford. Liverpool started the better team as their defensive positioning made it very difficult for Tottenham to play out. Allowing Spurs’ centre-backs to have the ball, Roberto Firmino would block the pass into Mousa Dembele, Mohamed Salah and Sadio Mane would block the passes into Winks and Dier, while also positioning themselves close enough to Rose and Kieran Trippier to put immediate pressure on them, while James Milner and Keita positioned themselves close to Winks and Dier and Georginho Wijnaldum covered behind them or tracked Christian Eriksen. This meant that if Spurs played into the midfield, Liverpool could immediately surround them. Dembele was the first pass out of defence but would be closed down by Firmino from one side and whichever midfielder was closer on the other. Dier and Winks dropped in next to him to help, but the same thing would happen to them, while the full-backs were trapped against the touchline. As a result, Spurs generally went long. A centre-back would hit a pass over the top into the space behind Liverpool’s backline and Harry Kane, Lucas Moura and Eriksen, typically pulling out to the right flank, would chase. This was previously an effective tactic, but Liverpool’s defence is much-improved now: Andy Robertson is harder to drag out of position than Alberto Moreno and faster than Milner, Virgil van Dijk is dominant in the air and not prone to the bad decisions of Dejan Lovren, while Joe Gomez has made a good start to the season and Trent Alexander-Arnold is always improving on the right, and Alisson Becker is on hand to sweep up behind them where previously Simon Mignolet would be stuck to his line and Loris Karius was error-prone. Liverpool’s pressing could quite easily be bypassed previously with a simple ball in behind, but now the backline can easily deal with these long passes, leaving Kane, Moura and Eriksen smothered by the back four and Wijnaldum in this match. This was even worse at the start of the game as Spurs players kept getting caught offside. Tottenham’s defending was far less effective. Their front two would press the centre-backs, while Eriksen would cover either Robertson or Wijnaldum, but this left Alexander-Arnold on the right flank and one of Robertson and Wijnaldum free. Always left alone, Alexander-Arnold was the free man most often used by Liverpool. Milner would often pull out right to the flank next to Salah and the three of them would overload Tottenham’s left side, with Firmino nearly getting two goals in the first two minutes – the first disallowed for offside after Sadio Mane moved towards the ball and the second a close miss. Winks moved out to close down Alexander-Arnold, but he was having to start his runs from so far away due to him initially defending the centre of midfield that he could never get close to the teenager. This meant Liverpool were quite easily able to work the ball into the final third, where they were left Spurs exposed four against four, with Salah occupying Rose and Milner pulling high and wide forcing Jan Vertonghen to move across and help Rose, leaving Toby Alderweireld and Trippier with no cover against the quick and intelligent movement of Firmino and Mane. Part way through the first half – corresponding roughly to the time Spurs managed to stop being caught offside, making them look like they were gaining some momentum – Milner and Alexander-Arnold switched positions in the build-up. Milner would drop back alongside Gomez, allowing Alexander-Arnold to push forward. The young right-back was reluctant to position himself as high and wide as Milner had however, meaning Vertonghen wasn’t required to move so far across. Keita would often push up alongside Firmino and Mane but it was less effective without the Spurs backline being so stretched. Liverpool were still the much bigger threat however. With Rose and Trippier pushing up in possession, Salah and Mane had plenty of space to attack behind them, with Liverpool quickly releasing the ball into them whenever they won it back. Liverpool failed to convert these chances, partially due to their own wastefulness but also because of some good defending by Vertonghen and Alderweireld, who would position themselves so the forwards couldn’t easily shoot or pass, slowing them down for long enough to get their teammates back. This did eventually lead to the opening goal however. Alderweireld’s cross-field ball was blocked by Firmino, the rebound falling to Mane to attack Spurs’ backline – it was eventually forced out for a corner, only for that to then be converted by Wijnaldum. Pochettino made a slight change at half-time, moving Moura wider so that Alexander-Arnold didn’t have as much space, making it harder for Liverpool to play out. Liverpool soon got a second though. Mane came deep to get on the ball, drawing Trippier with him, then layed it off to Robertson and sprinted behind the slower right-back. The Senegalese had space to dribble to the by-line and his pull-back was eventually scrambled across the line by Firmino. It was a remarkably simple goal but showed just how much the pace of Liverpool’s widemen threatened Spurs’ full-backs. Pochettino kept adding attackers, changing to a 4-2-3-1 and moving Eriksen to the base of the midfield, but he struggled to get around the fundamental issue posed by Liverpool’s defending so Spurs rarely threatened Liverpool, only managing a late consolation goal from a set-piece.